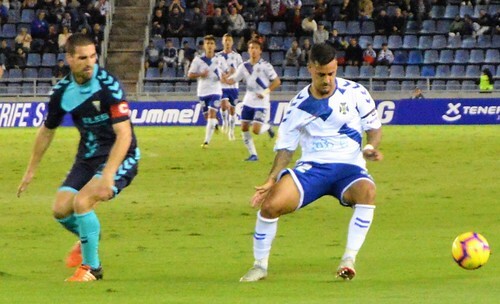 Five mid week goals in a friendly at lowly La Orotava was supposed to sharpen up CD Tenerife but despite good build ups, they couldn´t find a way past Albacete and ended with a frustrating 0-0 home draw. A return to a traditional back four gave the side more stability, Malbasic hustled and bustled up front but goals were elusive, and they are the key to pulling away from the relegation zone. At least a couple of wayward players returned to top form. Jorge was dominant in the centre of defence from the moment he saw off early danger from Febas. Eugeni had a pop for the visitors that produced a fine low save from Dani Hernandez to fend off the shadow of recent wobbly displays. Olivera gave Dani another chance to shine with a close effort that the keeper pounced on. That signalled a robust response from Tenerife, with Nano looking lively and forcing their goalie to smother his shot from the left. Luis Milla nearly caught them out with one of his curling shots, Zozulya had to look smart to clear the danger. Albacete, nicknamed The Clockwork Cheese, arrived as one of the eye catching teams of the division, sitting in 5th place but only looked half wound up on the night. Febas wasted their clearest chance just before the break when he sent his free kick wide of the goal. 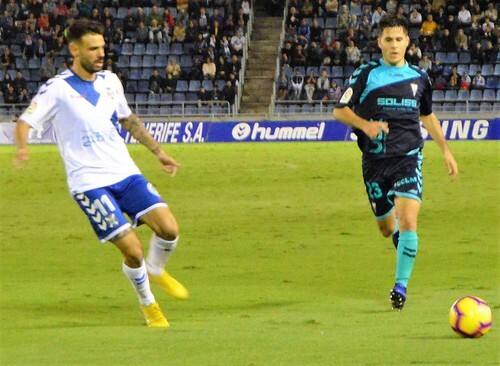 With a little slice of luck, Tenerife could have been ahead but the breaks are hard to find when results have been poor. 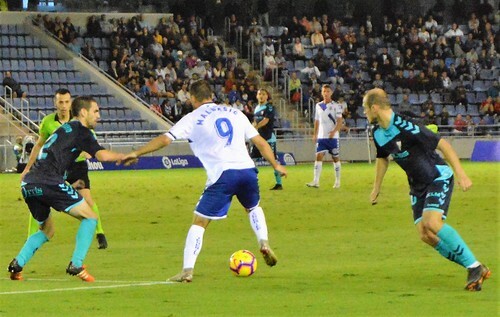 A foul on Malbasic gave Tenerife a free kick, four home players crowded around the ball before Luis Milla took a poor shot as Camille begged for the ball out wide. Alberto sprung up well to power in a header that the confident Nadal claimed well between the sticks. Nano tried to set up Malbasic, his pass was a bit short for the charging Serbian, and another let off for the visitors. Suso was having a quiet game and gave way to Joao Rodriguez after 63 minutes, the Colombian still looked a little rusty after a recent lay off and needs to be stretched with a full 90 minutes. Jose Narranjo became the second sub, replacing Bryan Acosta who left with unfinished business. Acosta was a booking away from a one game suspension, and should have forced the extra card so the ban could be served when he was unavailable anyway on international duty for Honduras a few days later. Incredibly no one on the coaching staff reminded him of that little useful nugget, a worrying glimpse into the slack way the club is run. 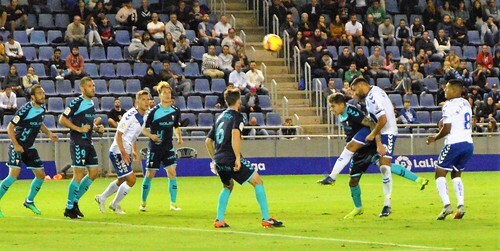 There was still time to unlock Albacete, Luis Perez blasted a shot high, Naranjo struck hisi effort straight at a defender, and Camille’s aim was true but the goalie rode his luck, patting the shot down and grabbing the ball. There was a nasty clash of heads when Gentiletti and Naranjo went for the same ball, after lengthy treatment the Albacete player had to go off, Naranjo played on but felt the affects for a few days afterwards. 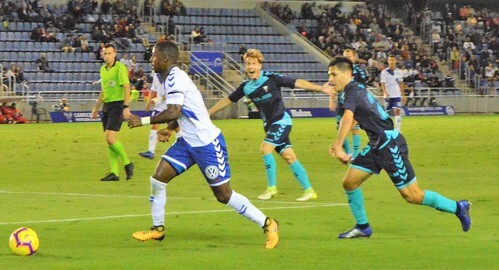 Final home sub Tayron added some renewed urgency to Tenerife as he made some determined runs down the central channel. Malbasic bulldozed his way past the visiting defence and squared the ball across the face of the goal, Naranjo should have popped it in the net but ran over it without applying the needed touch. The result could have gone either way in the closing minutes. Joao carved an opening but Jorge’s shot hit the post. At the other end Albacete had their own near thing when their attempt was thwarted by the woodwork. A draw was probably a fair result and leaves Tenerife hovering over the drop zone in 17th place. Coach Oltra has a long list of potential absentees for Saturdays trip to Osasuna, Jorge is on Spain under 21 duty, Acosta in Honduras, Alberto suspended, and injury niggles for Naranjo and Suso. January is six games away, Tenerife need to dip into the transfer market again, a goal scorer is an absolute must.